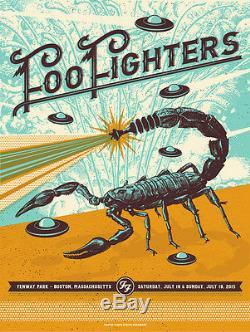 The Foo Fighters at Fenway Park - Boston - MA - 7/18-19/2015. Artist Edition of only #/55!! The item "Foo Fighters Poster 7/18-19/15 Fenway Park Boston MA Signed & Numbered #/55 A/E" is in sale since Saturday, July 25, 2015. This item is in the category "Entertainment Memorabilia\Music Memorabilia\Rock & Pop\Artists D\Dave Matthews Band".